With a pavilion overlooking an infinity pool and weir, the lodge sits in a classic Australian landscape dominated by Mount Mulligan’s 18-kilometre (11-mile) sandstone ridge. 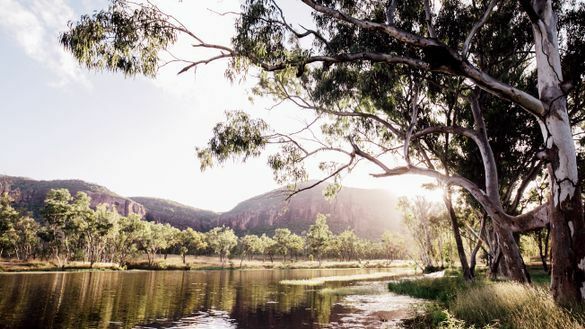 This is Queensland’s answer to the Kimberley’s outback paradise, El Questro and it’s going to be spectacular. Due to open in the second half of 2018. In late 2018, Hobart will welcome The Tasman, a Luxury Collection hotel by Marriott, which will take over heritage buildings located at Parliament Square. And it’s all systems go in Perth, where 2018 openings include a QT (July) and a Westin (April) in the city centre, and a DoubleTree by Hilton (first half of 2018) in the inner city neighbourhood of Northbridge. Ever been to a restaurant and eaten green ants? What about mangrove seeds? Or kangaroo tendon with Tasmanian mountain pepper? Australia’s native flavours have been gaining momentum for several years now, but the nod to Orana – recently awarded Australia’s 2018 Restaurant of the Year – cements their place firmly in the national consciousness. Owner-chef Jock Zonfrillo visits Aboriginal communities in some of the most remote corners of the continent to find his ingredients; he’s staked the restaurant’s name on serving Australia’s exquisite native flavours. If you’re lucky enough to get a table here – there are just 11 – expect to eat 18 courses featuring 50 to 60 native ingredients. Orana also has a sister restaurant just downstairs, Bistro Blackwood, offering a similar approach to native ingredients, at a more accessible price point. There are many other restaurants showcasing Australia’s unique produce: experience native flavours at Attica in Melbourne and Brae in rural Victoria, both of which were named among The World’s 50 Best Restaurants for 2017. At Attica, chef Ben Shewry serves dishes such as whipped emu egg with quandong (a native fruit) and grilled marron (an Australian lobster) with desert lime. At Brae, chef Dan Hunter provides an extraordinary, ever-changing menu from local ingredients, many of which are grown on site on the Brae organic farm, or foraged from the local environment. Wukalina Walk isn’t just another guided hike – it’s a spiritual journey into Palawa (local Aboriginal culture). Launching in January 2018, the walk takes place over four days and three nights, crossing the stunning landscapes of north-east Tasmania (including the dramatic Bay of Fires, home to white beaches, orange boulders and clear waters) while gaining deep insights into local Aboriginal culture and enjoying world-class accommodation, food and wine. Guests get to meet elders, hear Palawa creation stories and take part in cultural practices that have been passed down over thousands of years. Accommodation is in bespoke Palawa-inspired huts and a renovated lighthouse keeper’s cottage. The operation is Aboriginal owned and operated, with two guides leading a maximum of 10 guests. There are places that look beautiful from the water, and places that look beautiful from the air, but some just have to be seen from both angles. Perth is one of them, which is why it’s a great place to hop aboard a seaplane and get some stunning views of the city before heading off to one of three iconic West Australian destinations. Swan River Seaplanes started out in early in 2017 with a Margaret River Tour to taste fine wines in one of Australia’s top wine regions and has recently added two more tours to its itinerary. The Pinnacles – Taste of WA tour offers a dramatic trip north to the Pinnacles Desert as well as a fresh crayfish lunch; while the Rottnest Day Tour calls in on nearby Rottnest Island, home to beautiful bays and famously photo-friendly marsupials known as quokkas. If one day just isn’t enough, three and four-day Margaret River Retreats launched in December 2017, featuring luxury accommodation and gourmet food and wine. Want to see wombats in the wild? It’s well known that Wilsons Prom is the place to go. The southernmost tip of the Australian mainland, ‘the Prom’ (near Melbourne) is home to Wilsons Promontory National Park, offering 50,000 hectares (124,000 acres) of coastal beauty, wilderness, and a wealth of wildlife, all­ surprisingly close to Melbourne. Bushwalks – short and long – have been popular forever, but the idea of exploring Wilsons Prom from the water is just beginning to take off. Lizard Island Resort, an exclusive private island retreat on the Great Barrier Reef with almost as many private beaches (24) as villas (40), is now offering guests a unique perspective on the reef. Reef Expedition is a unique, multi-day guided tour of the reef led by scientists from the Australian Museum which also runs a research station on the island. See parts of the reef that are normally off-limits, with guided snorkelling and dives, and unparalleled insights into one the natural wonders of the world. Four nights’ accommodation is included and groups are limited to 12. That’s not the only memorable experience now on offer at the reef – a new scenic flight offers a lucky few the chance to land on an isolated isle sand, Wheeler Cay, in the middle of the ocean, while guests at exclusive island resort qualia, located in the Whitsunday islands, can now charter a Palm Beach Motor Yacht to explore the Great Barrier Reef. The resort vessel is the only Palm Beach Motor Yacht available for commercial use worldwide, although “bareboating” around the Whitsundays – where anyone can hire their choice of sailing vessel for an aquatic holiday around the islands – remains a popular pursuit. Also nearby is the Reef Sleep pontoon, where each night, a lucky few get the chance to sleep under the stars, 39 nautical miles from shore on the Great Barrier Reef. The Halo tiara that Kate Middleton wore at her wedding to Prince William, Elizabeth Taylor’s diamond and ruby necklace, and Princess Grace of Monaco’s 10.48-carat diamond engagement ring are among the items on display as Cartier: The Exhibition brings some serious bling to the National Gallery of Australia (NGA) in Canberra. More than 300 items loaned from royal families, celebrities and the Cartier Collection will form the biggest collection of diamonds, emeralds and precious stones ever seen in Australia. The exhibition, which is exclusive to the NGA, runs from 30 March to 22 July 2018. Other NGA highlights in 2018 include American Masters 1940-1980, which displays together for the first time the greatest American works from the gallery’s globally renowned selection (24 August-11 November 2018); and Picasso: The Vollard Suite, comprising 100 prints by Pablo Picasso (9 June-24 September 2018). The National Gallery is far from the only reason to call in on Canberra next year. Lonely Planet has named it No.3 in its top 10 list of cities to visit worldwide in 2018. While you’re there, make sure you check out Bar Rochford, the Gourmet Traveller 2018 Bar of the Year. Uluru may be ancient, and a hugely important spiritual site for the world’s oldest culture, but there are plenty of modern experiences on offer in the area. A new fine dining experience, Mayu Wiru (meaning “beautiful flavour” in the local Aboriginal Pitjantjatjara language) offers exquisite food featuring local ingredients, followed by a nightcap on a sand dune and a guided tour of the stunning Field of Light Uluru art installation, which is not only recommended by none-other than Chris Hemsworth, but has proved so popular that its run has been extended until the end of March 2018. Meanwhile, the famous Sounds of Silence at Ayers Rock Resort will be celebrating its 25th anniversary year with new menus featuring bush tucker ingredients. The luxury Uluru base camp Longitude 131recently unveiled a stunning new look, and Ayers Rock Resort offers an ever-more-impressive line-up of events, from the Aboriginal Tjungu Festival (25-29 April 2018) to the Uluru Camel Cup (25-26 May 2018). Uluru is one of Chris Hemsworth’s top Australian holiday experiences. The new, multi-billion-dollar Barangaroo waterfront precinct in downtown Sydney continues to evolve, with the latest round of openings including flagship restaurant Barangaroo House. Sydney restaurateur Matt Moran’s three-storey playground which opened in December 2017 includes a ground-floor bar and eatery, first-floor restaurant and a rooftop terrace bar overlooking Darling Harbour, with menus from innovative head chef Cory Campbell (formerly of Noma in Copenhagen and Vue de Monde in Melbourne). It will join an array of acclaimed eateries such as Banksii (the name is a nod to venerable British botanist Sir Joseph Banks, who studied many native Australian plant species during Britain’s initial explorations of the continent – Australian flora is heavily incorporated into the Mediterranean-inspired dishes). On the other side of Darling Harbour, the area’s extreme makeover continues with the addition of the Sofitel Sydney Darling Harbour, a 590-room luxury hotel with an infinity pool offering city views and a champagne bar. Between the two is the Hyatt Regency Sydney – which opened late 2016 – and the site of the upcoming W Sydney, slated to open in 2019 as part of the boundary-pushing development, The Ribbon. The beachside city of Albany (just south of the Margaret River region) was the last sighting of Australia for many of the 41,000 men and women who set sail from here, for World War I. Home to one of the nation’s most important cultural pilgrimages – the award-winning museum and war memorial, the National Anzac Centre – the city is set to shine even brighter in 2018, with a stunning light installation by renowned English artist Bruce Munro. Field of Light: Avenue of Honour will form part of Albany’s commemoration of the 100th anniversary of the end of the first World War this year, and will feature more than 13,000 illuminated glass spheres, representing the national flowers of Australia and New Zealand. Mr Munro’s most recent commission Field of Light at Uluru has attracted more than 120,000 visitors since opening in April 2016 whilst Field of Light: Avenue of Honour is expected to attract more than 28,500 attendees. The work will be installed in Albany Heritage Park and the Desert Mounted Corps Memorial, from October 2018 through to April 2019.